The cephalopod body, and especially the octopus body, is a unique object with respect to these demands. When part of the molluscan “foot” differentiated into a mass of tentacles, with no joints or shell, the result was a very unwieldy organ to control. The result was also an enormously useful thing, if it could be controlled. The octopus’s loss of almost all hard parts compounded both the challenge and the opportunities. A vast range of movements became possible, but they had to be organized, had to be made coherent. Octopuses have not dealt with this challenge by imposing centralized governance on the body; rather, they have fashioned a mixture of local and central control. One might say the octopus has turned each arm into an intermediate-scale actor. But it also imposes order, top-down, on the huge and complex system that is the octopus body. This is something a lot of people know about the politics of being an octopus: your various members enjoy semi-autonomy. Tentacles are federated, after a fashion. They continue to act in a purposive manner even if they are cut off from the center. Weird! (See also: Montesquieu on monarchy.) But what does he mean by ‘these demands’? [Earlier] I contrasted sensory-motor views and action-shaping views of the evolution of nervous systems. The action-shaping approach is less familiar, and it took some effort, historically, to develop it. The central idea is that rather than mediating between sensory input and behavioral output, the first nervous systems came to exist as solutions to a problem of pure coordination within the organism — the problem of how to coordinate the micro-acts of parts of the body into the macro-acts of the whole. Why is it worth having such a brain [a smart one! ], or any nervous system? What are they for? As I see it, two pictures guide people’s thinking about the matter. These pictures are visible in scientific work and they permeate philosophy, too; their roots run deep. According to the first view, the original and fundamental function of the nervous system is to link perception with action. Brains are for the guidance of action, and the only way to “guide” action in a useful way is to link what is done to what is seen (and touched, and tasted). The senses track what’s going on in the environment, and nervous systems use this information to work out what to do. Modifying your actions in response to events going on outside you has to be done, yes, but something else has to happen, too, and in some circumstances it is more basic and more difficult to achieve. This is creating actions themselves. How is it that we are able to act in the first place? Just above, I said: you sense what’s going on and do something in response. But doing something, if you are made of many cells, is not a trivial matter, not something that can simply be assumed. It takes a great deal of coordination between your parts. This is not a big deal if you are a bacterium, but if you’re a larger organism, things are different. Then you face the task of generating a coherent whole-organism action from the many tiny outputs— the tiny contractions, contortions, and twitches— of your parts. A multitude of micro-actions must be shaped into a macro-action. Basically, he is saying there has been a tendency to treat organisms as having only a foreign policy. But any complex, active body has, as it were, a domestic policy and politics as well. Godfrey-Smith really could make what he is saying clearer if he said: there is a fallacy similar to that made by IR realist theorists who neglect domestic factors in their explanations of interstate relations and conflicts. A large nervous system evolves to deal with coordination of the body, but the result is so much neural complexity that eventually other capacities arise as byproducts, or relatively easy additions to what the demands of action-shaping have built. 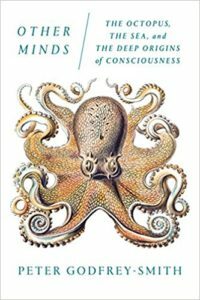 I said “or” just above—byproducts or additions—but this is definitely an “and/or.” Some capacities — such as recognition of individual people — might be by-products, while others — such as problem solving —are the results of the evolutionary modification of the brain in response to the octopus’s opportunistic lifestyle. In this picture, neurons first multiply because of the demands of the body, and then sometime later, an octopus wakes up with a brain that can do more. Certainly it seems that some of its impressive behavior is fortuitous, from an evolutionary point of view. Remember again those surprising behaviors in captivity, the mischief and craft, the engagement with humans. There is, it seems, a kind of mental surplus in the octopus. Even if you have a robust and stable civic society of semi-autonomous members, the central government will grow, and grow crafty, and make all sorts of plans for messing with humans. It’s just like Hayek feared. This was a superb book – enjoyed it immensely. I hope there is no extrapolation to society from the fact that octopuses with semi-autonomous cognition can learn and adapt superbly, but are also fragile, vulnerable to predators, unable to pass on what they learn to descendants, and more or less fall apart spontaneously after their (short) lifespan. I loved this book. Then again, I like cephalopods, evolutionary biology and cognitive science, so there was little surprise. In the “did you know” department, have you followed the most recent hypotheses on how cephalopods manage to imitate colors despite lacking enough color-sensitive cells in their eyes? and ever heard of pre-hatch learning among cuttlefish? Or complex systems of single computational units with retroactive loops have emergent cognitive properties. It’s just like Hayek hoped. The correlation between encephalization and longevity suggests metabolic regulation and various biochemical and hormonal functions are also actions shaped by the nervous system. Personally, my brain is not really competent to coordinate two arms and legs. I am awed by the ability of the octopus to handle eight, and coordinating the actions of chromatophores along the way too. Yet, although the number and size of these semi-autonomous arms is impressive, one can get somewhat distorted notion of how centralized the human organism is. There is fairly complex processing in the retina/optic nerve, and all those different neural reflex arcs whose pathways resolutely avoid the brain. The abbreviation CNS in the philosopher’s picture of the mind appears to mean “brain.” But it also includes the spine, which means the “center” has a length a significant fraction of the whole body length. It’s also a fascinating book about cephalopods! which have true eyes with corneas, lenses and retinas, and swim purposefully guided by what they see, but have no optic nerves transmitting the images perceived to their brain, because they have no brain. And yet they swim intelligently. I’m not sure there is a political analogy for them. He (and most people) completely under-rate the complexity of bacteria. I don’t mean conscious decision-making obviously, just more nervous architecture to manage all that flexibility. Obvious analogy to the box jellyfish: The market. No center, but diffuse coordination. Also, ants. Seem to coordinate their attacks quite well without the queen getting directly involved. The phrase “embodied cognition” made me recall Hubert Dreyfus’ What Computers Can’t Do (1972 and later editions) and its section, “The Role of the Body in Intelligent Behavior”. Which let me to “The World Is its Own Model or Why Hubert Dreyfus Is Still Right About AI” by Louis Savain (online 10/2017). This reading is so interesting I risked not surfacing for quite a while. . . Yet not so far as endangering my dilettante’s credentials. Dreyfus has been the foremost critic of artificial intelligence research (What Computers Still Can’t Do) since its early days. The AI community hates him for it. Here we are, many decades later, and Dreyfus is still right. Drawing from the work of famed German philosopher, Martin Heidegger and the French existentialist philosopher, Maurice Merleau-Ponty, Dreyfus’s argument has not changed after all those years. Using Heidegger as a starting point, he argues that the brain does not create internal representations of objects in the world. The brain simply learns how to see the world directly, something that Heidegger referred to as presence-at-hand and readiness-to-hand. Dreyfus gave a great example of this in his paper Why Heideggerian AI Failed and how fixing it would require making it more Heideggerian. Funny, I was Bert’s TA at Berkeley for several years. And he was the second reader on my dissertation (despite not really being a Wittgenstein guy himself.) I am the only Bert student ever who just doesn’t get what the fuss is about with this Heidegger stuff. (And the Black Notebooks haven’t exactly caused me to rethink that.) But I should check out new writing arguing a Bert anti-AI line. I always thought that line of his was implausibly strong. There’s all sorts of political implications here that Dreyfus doesn’t draw out (and Heidegger wouldn’t, of course) but, at the risk of offending the, ahem, ‘philosophical community’, I still think there’s something in Popper’s critique of Plato (in The Open Society) and that this relates to Plato’s psychology. Most modern psychologists have brains on…well the brain, and are keen to make the (gigantic, although mainly unheralded) leap that because brains are necessary for cognition, they are therefore sufficient for cognition). Plato seems to have had a similar idea. But by definition if you are exalting the brain, you are (implicitly) demeaning the hand. And this leads to conclusion (more by inference and analogy than straight logic) that ‘book learning’ is, in an of itself, ‘superior’ to, in some objective sense, to ‘hand learning’: i.e. knowing that is better than knowing how. And who knows ‘that’? Intellectuals, teachers, lecturers, journalists. And who knows ‘how’? Plumbers, machine workers, mechanics. There are unquestioned political implications here, in Plato, and, of course, in Socrates (cf https://msuweb.montclair.edu/~furrg/essays/ifstoneonsocrates.html which seems to have been mainly brushed under the carpet). Embodied psychology has political implications it seems to me and social psychology (i.e the idea that thought is ineluctably social) even more so. If you don’t like Heidegger, which is understandable, almost all of the best bits in him can be found in other sources: the anti-representationalism in Reid and J.L. Austin, the dissolution of the subject-object distinction in Dewey, the linguistic aspects in the later Wittgenstein, and the emphasis on the body in Merleau-Ponty (and, some would argue, the later Husserl). With some minor exceptions, you don’t actually ‘need’ Heidegger to be Heideggerean, especially if you are uninterested in the ‘problem’ of ‘Being’ (of which, cf Lakoff and Johnson’s discussion in Philosophy in the Flesh). Sitting an old geezer seminar with Mark Johnson last Spring, when Bert Dreyfus died, I mourned Bert and dreyfussed as best i could in Johnson’s class on “mortal ethics,” to the point that he invited me to sit his Fall quarter class, reading through Dewey’s Experience and Nature. Scales fell from my heideggerian-tinted glasses from the second paragraph of the preface that Dewey writ in 1925 — alluding to the hermeneutical circle — that here in E&N was an agreeably comparable text to B&T, equally insurgent and along similar lines. So now I am cobbling together some sort of Dewey-Heidegger Reconciliation Project, and just found Godfrey-Smith essay/review of E&I, always looking for co-readers, as Dewey is such a master prose stylist, also as was our Heidegger. At any rate, my first read through E&N, and further ‘firsts’ in Dewey’s thought shows a great deal of congruence between these two old boys, and bonus: Dewey was a nice man… Why wasn’t I told about this 40 years ago? Using Heidegger as a starting point, he argues that the brain does not create internal representations of objects in the world. The brain simply learns how to see the world directly, something that Heidegger referred to as presence-at-hand and readiness-to-hand. Fun fact (? ), after reading Other Minds, I wrote a science-fiction short story in which octopoid alien scientists (with the expected distributed intelligence) puzzle around human cognition and especially how humans are able to systematically produce recursive cognitive structures despite apparently lacking the sensorimotor apparatus required to detect recursion (just like human scientists puzzle on how cephalopods can imitate so perfectly outside colors despite apparently lacking the sensorimotor apparatus required to detect colors). It seems to me that, while there is an obvious “class preference” in the opinion of value of the ancient philosophers about the various kinds of knowledge, there is also an important distinction in the way the relation between “will” and “intelligence” is conceived. If we take a modern evolutionary view, we first and foremost are individuals who need to eat and want to reproduce, and in order to eat more and reproduce more we evolved the ability of creating “model worlds” in our brain, in order to predict what happens in the real world. In this view, “intelligence” is a byproduct of “will”. I think that this is the point of view of german idealists, though they spun it in a weird mysthical way, and is also the point of view of C.S. Peirce (“pragmaticism”). But before this, “intelligence” was often assumed to be a distinct thing from “will”, and often seen as superior, in some way, even to “noble” forms of action. Rorty explored this, did he not? But he sadly died young and left the field to Searle. Cognition, esp social cognition, flows as much from what is ignored as from what is seen (… the famous gorilla …). So the brain is a repressor as much as a sensor. That would match the point about the Octopus as the oppressor of the Arms. Why do you link to [amazon]? jim@9: no, I don’t think so. The market doesn’t make a conscious, enforced decision to move in one way or another for its own benefit. A cubomedusoid, though without a central brain, does. Just to be precise, I specifically didn’t say that Plato ‘exalted the brain’, I said he had a ‘similar idea’. According to Wikipedia, it was Alcmaeon of Croton who first posited the brain as the seat of the intellect. This was (like Plato’s speculations) in no way a scientific hypothesis: Alcmaeon believed that ‘the human soul was immortal and partook of the divine nature, because like the heavenly bodies it contained in itself a principle of motion’ (he seems to have been influenced here by speculative metaphysicians like Thales et al) (https://en.wikipedia.org/wiki/Alcmaeon_of_Croton). Much of the core work in the Western intellectual tradition (especially as it relates to the social or human sciences), especially in the last 200 years, is an attempt to secularise or naturalise what are essentially metaphysical (or even religious) guesses, and then pass them off as ‘science’ by assuming what you are meant to be proving, and if these speculations have convenient political implications, so much the better. @17 Rorty is a great philosopher (perhaps one of the last in the Western tradition) and his anti-representationalism is crucial. Unfortunately discussions of his name tend to get sidetracked into discussions of ‘relativism’ (most contemporary discussions of ‘relativism’ tend to be the modern equivalent of ‘how many angels can dance on a pinhead’: parlour games for aspiring intellectuals), but it’s his anti-representationalism which is the real gauntlet thrown down to (e.g.) Fodor et al. Most philosophers and cognitive scientists in the representationalist tradition have dealt with Rorty’s arguments by ignoring them IMHO. in what ways are human intelligence inferior to bacterial intelligence, given the relative reproductive success of the latter? Hidary@22: show me a city or a machine built by octopuses, show me a work of philosophy written by octopuses, of poetry written or even sung by octopuses, and I might begin to take you seriously. >Animals (like Homo Sapiens Sapiens) can only be ‘judged’ in terms of their ability to survive and reproduce. Everything can be judged in terms of anything: the judge decides, and the only judge in sight is Homo Sapiens Sapiens. Evolution is not a judge or a deity, just a fact. I humbly submit that in my experience, conversations with animals tend to be far less rich in information, meaning and complexity than conversations with humans, especially once one sets aside the initial element of exotic novelty, charm and refreshing primitiveness. Octopuses are free to assess this differently, but I reserve for myself the right to act in accordance with my own assessment and not with that of the octopuses. They are, of course, also entitled to act in accordance with theirs, and I wouldn’t expect anything else. And the response to that question is always the same, regardless of what one is discussing: ‘it sort of looks like that’. Mostly negative evidence, of course (the conspicuous absence of [anything that looks like] octopus blogs, octopus philosophical treatises and octopus phonology, morphology and syntax, for instance), but you might as well be a theist – or, more consistently, a mineral – if you aren’t OK with basing assessments and decisions on negative evidence. This is true, and if Pinker et al of the Evolutionary Psychology crowd weren’t so keen to distort the science to make tedious right wing comments they might care to reflect that taking Darwinism on board really tends one towards vegetarianism (that’s the most obvious ‘political’ point to infer from it). Which leads to the conclusion that in 200/300 years people might back on the fact that many of us eat meat in much the same way as we look back on the fact that (e.g.) Washington etc. owned slaves.